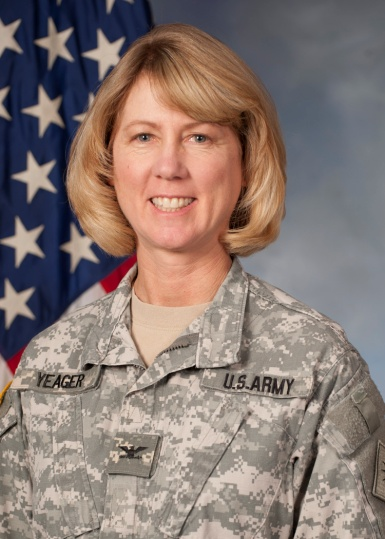 General Laura Yeager, United States Army, is a qualified Black Hawk and Huey helicopter pilot with over 1500 hours of rotary wing flight time. She has 29 years of military service, including serving as the Deputy Commanding Officer for the 40th Combat Aviation Brigade during its deployment in Iraq in support of Operation New Dawn in 2010 and 2011. Chief of Staff: selected to serve as the Chief of Staff for the California Military Department Joint Staff in 2013. Overseeing 22,000 members from the Army National Guard, Air National Guard, State Military Reserve and Community/Youth Programs who perform missions daily in support of the State and Federal government. In 1986, General Yeager earned a Bachelor’s Degree in Psychology from the University of California at Irvine and in 2008 she earned a Masters degree in Counseling Psychology from Chapman University College. Her military education includes Army Medical Department Officer Basic and Advance course, Combined Army Service Staff School, and Command and General Staff College. She also graduated in 2011 from the U.S. Army War College, earning a Masters degree in Strategic Studies. General Yeager has been honored with several awards and decorations including, but not limited to, the Bronze Star, Legion of Merit, Meritorious Service Medals, Army Commendation Medals, and Army Achievement Medals. BG Laura Yeager is a soldier, gifted leader and skilled, professional aviator. I can name no one for whom I have more respect during my 37 years of military service (& c. 2 years GWOT). Her well deserved promotion to BG restores my faith in our system of selection for military promotion. I’m proud to have been able to attend BG Yeager’s promotion ceremony. My gut tells me that I would have been proud to serve with her anywhere. She is AIRBORNE! Thanks to the crew and staff of Vietnam Helicopters for the memorable ride to and from the ceremony. That day and significant event will not soon be forgotten. Wonder if she is related to another pilot named Chuck? ?